Exerpeutic 900XL Recumbent Bike Review - Eat. Move. Hack. A stationary recumbent bike is one of the best types of exercise equipment for the obese. Unfortunately, many bikes lack the space larger riders need. The Exerpeutic 900xl extended capacity recumbent bike with pulse is designed to resolve the dilemma by accommodating those who simply can’t fit on standard models. It features design elements that make it more stable and comfortable even for those who are near or at its 300 lb. weight capacity. Cycling is an exercise that puts less stress on the joints and ligaments. It is a type of low impact aerobics that many with skeletal issues can still manage, and can prove especially helpful for those who suffer pain in their knees and back, which is common for those who are overweight and out of shape (1). Recumbent bikes are particularly useful, as they provide more back support while putting more emphasis on toning the abs, hips, and thighs, which is a problem zone for many. They are the ideal exercise machines for those who want to burn fat and slim down while enjoying a comfortable ride (2). Check out our Exerpeutic 900XL review below to see if it is the perfect recumbent bike for you. The 300 lbs. weight capacity of this recumbent exercise bike is not remarkable. There are a lot of standard stationary bikes that can handle this same amount, and there are heavy-duty machines that can take on much more. But the Exerpeutic 900xl is to be preferred by those who are close to this weight because at 54”L x 22”W x 34”H it gives more room to large riders than standard recumbent bikes. And the extended leg stabilizers mean not having to worry about wobbling during the workout. This bike has a low center of gravity and larger seat, allowing it to comfortably accommodate riders of a wider range of sizes. The seat is 16 inches wide. At only 63 lbs., this is a very lightweight bike. It is made to be convenient to use at home, which sometimes means having to move the machine around a lot. It follows, therefore, that there’s a magnetic tension control system instead of a weighted flywheel. The heavier the flywheel, the smoother the ride, but that can make a bike too heavy. The magnetic tension adds the same smoothness needed to keep the ride enjoyable but without making the machine difficult to relocate. Monitoning your heart rate during aerobics can help you progress towards your goals faster. The easy-to-read LCD display and conveniently placed heart rate grips of the Exerpeutic 900xl extended capacity recumbent bike with pulse enables you to always know if you’re in the right zone. You want to make sure you hit that fat burning zone and spend time there so that the results can be forthcoming. Once you know what your target heart rate is for best results, the 900xl can help you find how to hit it. Your fat burning zone is calculated by subtracting your age from 220 and finding what is 60 to 70 percent of that (3). Your current heart rate isn’t the only data the machine displays. The convenient and easy-to-read monitor gives you a number of helpful readouts about your workout, including distance, calories burned, time, and speed. The scan feature makes it easy for you to scroll through the data during your session. The 8 levels of resistance provided by the Exerpeutic 900xl extended capacity recumbent bike are plenty for those just getting started on their fitness journey. The highest level gives plenty of challenge without diverting to a muscle-building rather than aerobic activity. In short, this machine has what it takes to help users burn fat, which would be the most common goal for its buyers. In keeping with the aim of serving the needs of larger riders, this recumbent bike comes with larger-than-normal pedals. The roomy straps help keep the feet in place so that each rotation is a smooth one. Not having to worry about your feet slipping of the pedals helps keep the focus on your workout where it should be. The “Smooth Torque” cranking system of the 900xl is greatly responsible for its smooth, quiet ride. It has a V-belt drive. The result is consistent rotations that make users feel free to put their bodies to the test. The Exerpeutic 900xl extended capacity recumbent bike comes at an amazing price of around $200, making it one of the most affordable stationary bikes of this quality on the market. In fact, some buy it for price alone, without regard to its extended capacity. That it accommodates larger riders is the most exciting point of this exercise machine. WIth a large seat, extended leg stabilizers, and roomy pedals with foot straps, the 900xl is built to be the go-to recumbent bike for those who find the fit of standard machines uncomfortable. Users appreciate how quiet, roomy, and smooth running this bike is, especially in light of its affordable low price. Despite being built to fit larger riders, some find that the extended capacity of this machine isn’t extended enough. The 300 lbs. weight capacity is the same as with many standard recumbent bikes. Those who wear a men’s size 12 shoe or larger often find the footstraps a bit tight. And the assembly process can be a bit frustrating. Some have reported spending as much as 8 hours putting it together. Plus, the seat, though roomy, is a bit hard to sit on. 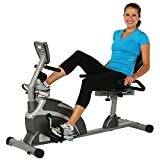 Those who want a nice, roomy low impact aerobics machine at an amazingly low price would do well to go with the Exerpeutic 900xl extended capacity recumbent bike. It allows users to enjoy all the benefits of recumbent biking within the comfort of their own home. And they’ll be comfortable indeed, despite the spacious padded seat being a bit too hard. The pedals and seat are both larger than what you would get on a standard model. The extended leg stabilizers and “Smooth Torque” cranking system keeps the ride smooth, steady, and quiet. This is an excellent recumbent bike for those who want to get their fitness journey off to a great start.